Horizontal Trusses are used where long span load bearing capacity is required. 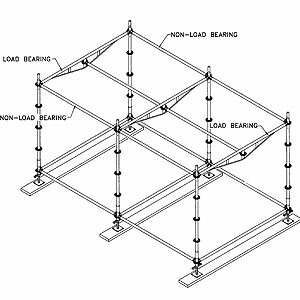 All load bearing and non-load bearing horizontals may be replaced with trusses. Note: Care must be taken not to overload the standards. The increased "area" must be considered. Consult factory for advice and loading information. For round or other irregular shaped structures, ideally it is most economical to vary the length of the inside versus the outside runners or horizontals. 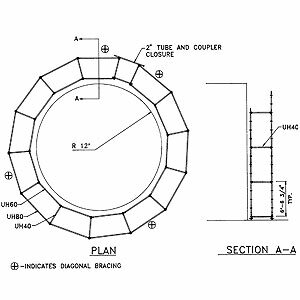 The spacing of each set of standards can usually be calculated to fit the circumference of the circular vessel or structure. A perfect closure bay is very unlikely; therefore, these final ties are accomplished with tubes and couplers. The actual assembly should be very similar to a straight running scaffold making certain that the first level is plumb and in perfect alignment. Alternate methods of assembly include considering the round layout, a series of towers connected inside and outside with additional horizontals or tubes and couplers.